Versace will launch Gianni Versace Couture, a new trio of fragrances for women, in March. The packaging, featuring napa leather cases, is similar to the brand's 2008 limited edition fragrance of the same name, Gianni Versace Couture. The three fragrances focus on notes that are personal favorites of Donatella Versace: violet, tuberose and jasmine. Gianni Versace Couture Violet (violet) ~ developed by perfumer Alexandra Kosinski, with mimosa, musk and heliotrope. "This fragrance is a tribute to violet, a flower with an unforgettable personality, strong and delicate at the same time. Its leaves and intense colour express power. The facets of powdery mimosa enrich its texture and opulence. The infinitely intoxicating and sensual touch of musk and heliotrope give the fragrance an ultra-glamorous signature." Gianni Versace Couture Tuberose (pink) ~ developed by perfumer Aurélien Guichard, with almond and ambrox. "Tuberose is a heady, sweet and precious flower; its voluptuously sensual aroma fascinates and hypnotises. This captivating scent is made even more irresistible by the gourmand touch of sweet almond, the velvety character of tuberose milk and the warm scent of ambrox- a fragrance for a woman ready to use all means to seduce without any inhibition." Gianni Versace Couture Jasmin (blue) ~ developed by perfumer Antoine Maisondieu, with ylang-ylang, rose and benzoin. "Jasmine is a multi-faceted, noble flower. In this fragrance, jasmine provides radiance and light while ylang ylang and rose enhance brightness and express all its richness. Sweet and opulent, jasmine embraces benzoin for a voluptuous and addictive trail." Versace Gianni Versace Couture will be in 100 ml Eau de Parfum, about $475 each; refills without the leather cases will be about $250. Update: I've added descriptions of the fragrances from the Harrods website, and an image of the bottles without the leather cases. The "Deluxe" version with the leather case is £300, the regular bottle is £155. Wait, what? $475????? From the house than brings us Baby Rose Jeans and Yellow Diamond? Ok wait, am I in a baby nursery now? What happened? If you are, it’s an expensive one. 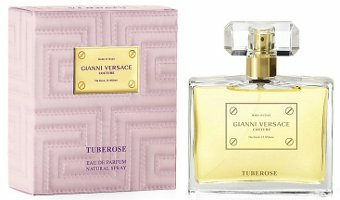 I wonder if the Tuberose will smell like Versace’s Blonde? That was a great fragrance. Talking about great fragrance, I wish they would bring back V/E, what an amazingly glamorous scent. Since Gianni died, their fragrances have been kind of crappy. Would have loved to try any of these, but that price of $475 is too steep for me. Seems that the Violet would be the one I would probably like. It’s just me or Versace made a tacky version of Jean Patou bottles and boxes?